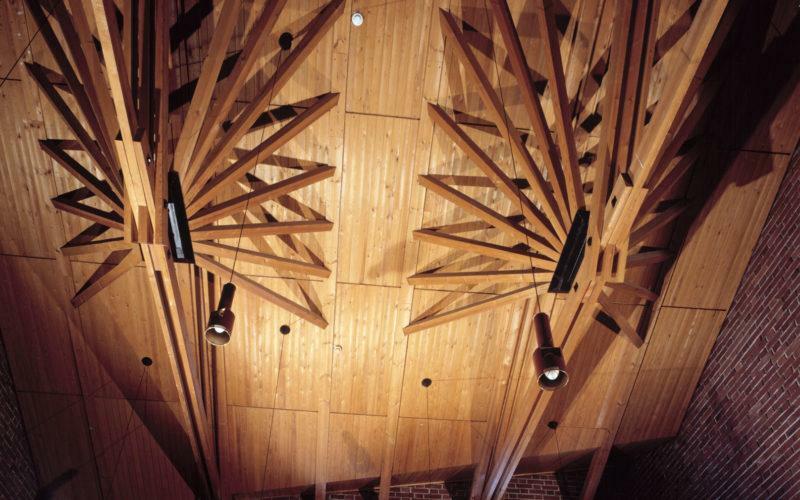 The building has a variety of functions. 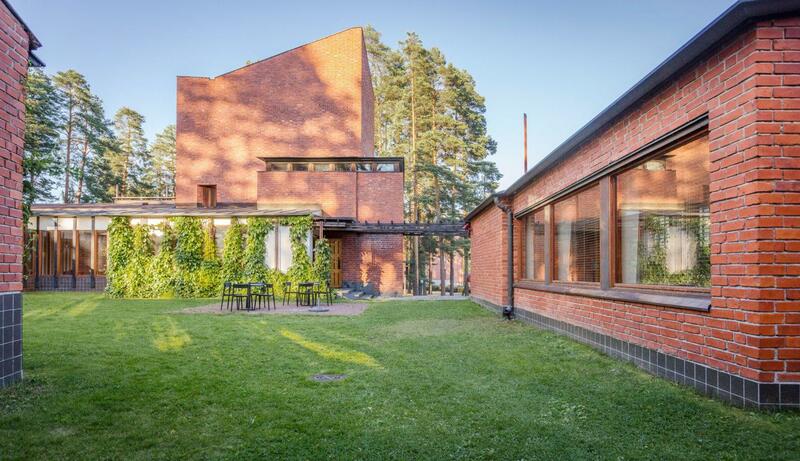 Aalto laid out four two-storey wings around a square courtyard set one storey higher than its surroundings. Apartments occupy one of the wings; the businesses face outward from the ground floors of two wings; and the administrative and cultural facilities look inward to the quiet courtyard. The dominant element of the building is the council chamber, which soars tower-like above the complex. 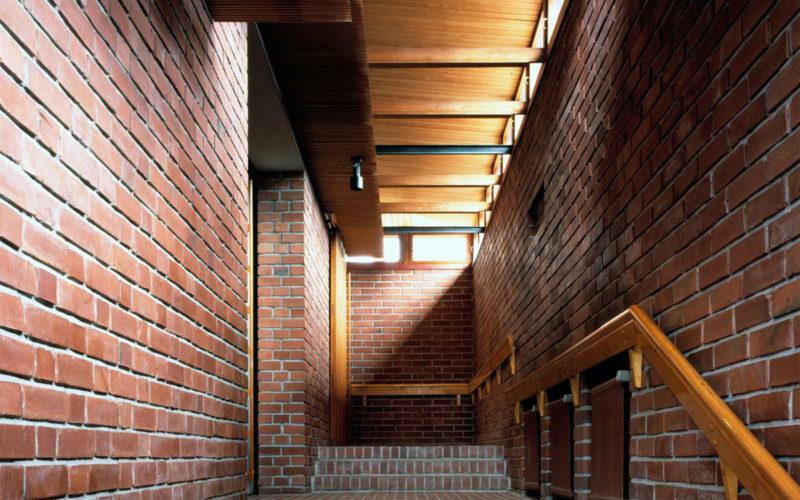 The main material used for the exterior as well as for the representative areas of the interior is bare red brick. 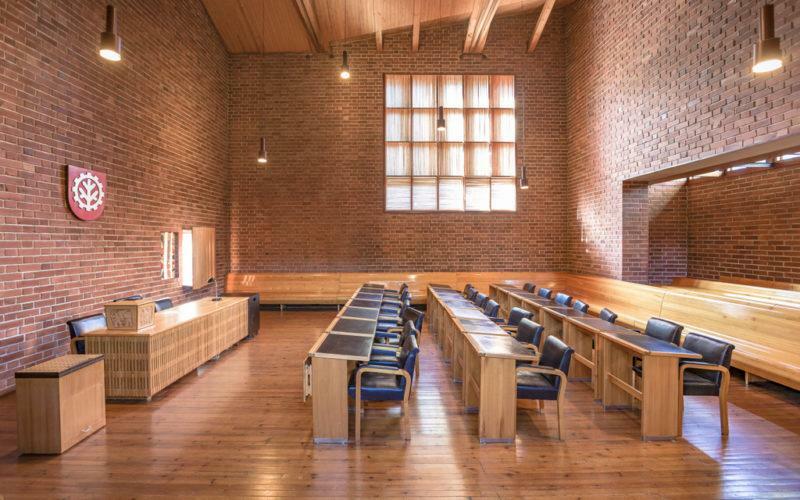 Säynätsalo Town Hall on the Alvar Aalto Foundation website. Säynätsalo is located approximately 270 kilometres away from Helsinki. From Jyväskylä city Säynätsalo is located approximately 15 kilometres away on Parviaisentie 9, Säynätsalo. The best way to reach Säynätsalo is either with a car or taking a bus or a train from Helsinki to Jyväskylä. From Jyväskylä to Säynätsalo there are local buses 16, 16M or 21 that go to Säynätsalo. The buses go approximately every half an hour and the travel time is approximately 25 minutes. Please note that the opening times of Säynatsalo townhall depend on the season. Please check opening times and prices in advance from Säynätsalo Town Hall’s web site. Please note that you can purchase publications about Säynätsalo’s townhall as download architectural drawings from Alvar Aalto web shop! There has been two guestrooms for booking from the very beginning of the building’s history. 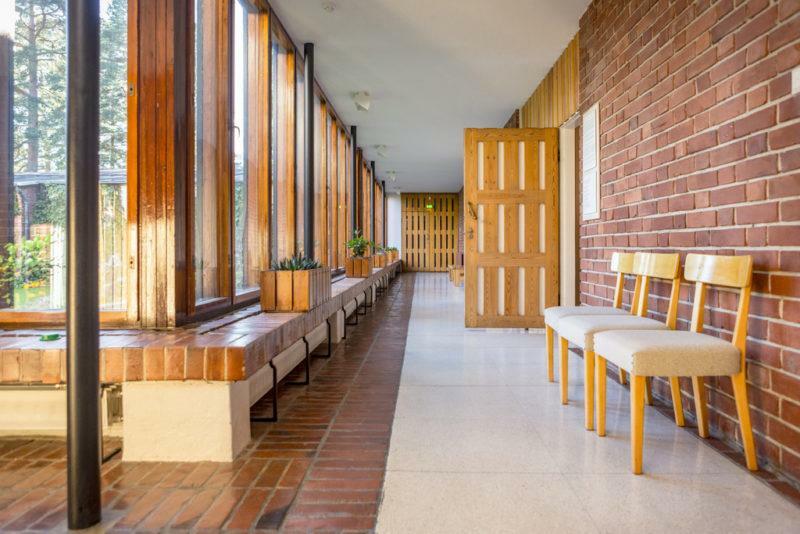 The rooms are named after architect Alvar Aalto and his wife – Alvari (7 m²) and Elissa (10 m²). Guestrooms are basic rooms with shared bathroom and toilet. The view directly to the patio is wonderful. The rooms are single rooms (extra bed available) and equipped with bed linens and towels, fridge, microwave, electric kettle and kitchen ware. Also there are two apartments ‘Henrik’ and ‘Hugo’ available. More information about the accommodation services.